The high-performance Electric Hoist & Motorized Trolley Kit is engineered for heavy-duty industrial service and is available in two-ton and three-ton capacities. 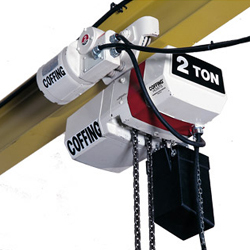 The kit includes an electric-chain hoist with motorized trolley, chain container, and six-button pendant. An operator pendant with standard 6-foot drop is included with the kit. Three-axis, six-button pendants are set for use with Powered Gantry Cranes equipped with floor-drive control. Trolleys are equipped with wrap-around side plates that act as bumpers to protect trolley wheels. Trolley wheels are machined and heat-treated with sealed, lifetime-lubricated ball bearings for extended product life. The Electric Hoist & Motorized Trolley Kit is designed to last in harsh conditions, like battery rooms and other industrial settings. Lifting heavy loads is simple, ergonomic, and reliable with this durable equipment. Safety and ergonomics are a key focus of the Electric Hoist & Motorized Trolley Kit. A mechanical load brake, motor brake, and overload clutch come standard to make this kit as safe as possible. Our engineers set the hoist and trolley speeds for minimal load swing as required for overhead removal and installation of industrial batteries. Make lifting industrial batteries or other heavy loads easy and safe with the Electric Hoist & Motorized Trolley Kit. Contact our sales team at 1.800.BHS.9500 to learn more about hoist kits or other Battery Handling Equipment.